Sonora Grill is a vegetarian and vegan-friendly restaurant. We take dietary choices and restrictions seriously and make a special effort to leave animal and dairy products out of our sauces and seasonings to accommodate all diners. Everything at Sonora Grill is made from scratch, so there are no hidden or unknown ingredients! half salad, half tostada. 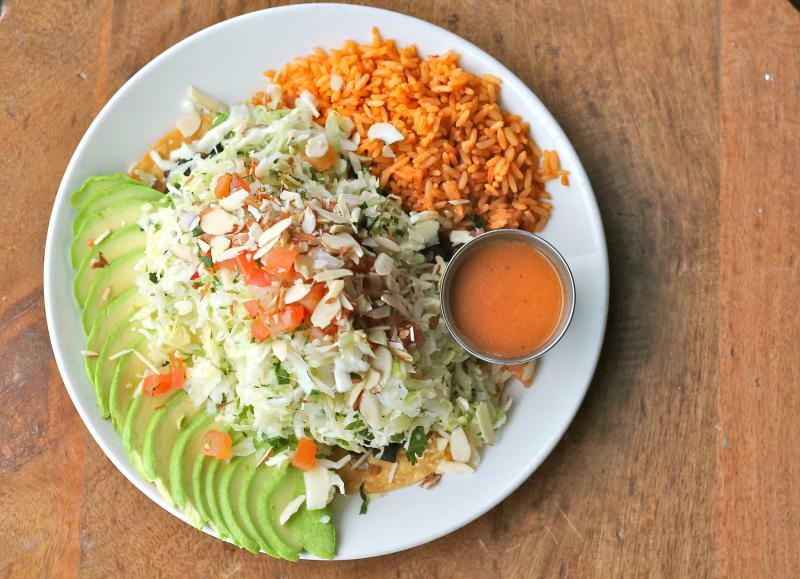 built on top of a tostada with a thin layer of black beans, topped with avocado slices, cabbage and almonds. With our house vinaigrette on the side. large handmade flour tortilla filled with sautéed portobello mushrooms, anaheim peppers and white onions. smothered in red enchilada sauce and topped with crushed almonds, and our dairy-free avocado cream drizzle. served with pico de gallo and guacamole. Cheese is optional. fresh guacamole and black beans inside of a large, handmade flour tortilla. cut into triangles and served with a side of vegan refried beans, rice and slaw. Optional to add cheese. large handmade flour tortilla filled with rice, black beans, tomatoes, onions, cilantro and guacamole. smothered in red enchilada sauce and topped with our dairy-free avocado cream drizzle. served with pico de gallo and slaw. Optional choice of cheese. portobello mushrooms, anaheim peppers and white onions sautéed in red enchilada sauce. topped with crushed almonds and sesame seeds. served with guacamole, pico de gallo and your choice of flour or corn tortillas. Optional choice of cheese. Crispy (deep fried) Avocado slices, romaine lettuce, pineapple, black beans, cucumber, pepitas, cotija cheese, pickled onions, mango-chipotle dressing. The Sonora Grill is a locally owned and operated restaurant. We have a passion for mexican cuisine. From our zesty salsa made with habaneros, moritas, or tomatillos, to our slow roasted Cochinta Pibil our kitchen is busy trying to exceed our customers expectations by serving breathtaking, savory food.